Our interview with tech savvy boss ladies at Hyphen- Labs is bound to be a great article, and we must add how we all looked hella fly walking down these Austin Streets. Who is going to put us on a fashion blog? The action is where the people are and the SXSW energy is proving to be contagious. The elements are all stacking up...it's the lifestyle. Crystal coded jaguar statues, kimchi french fries with bomb fried tofu, and chit chats with boss ladies and celebrities...OH MY! Heaven is this you? I think my favorite part of the day was my chat with Hustle Gang's 5ive Mics. 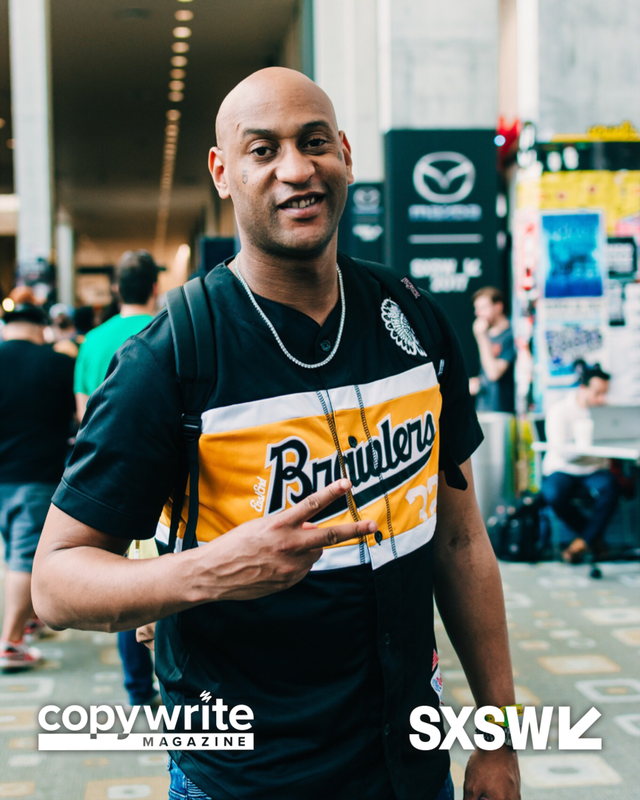 We had previously met a few years back in the MKE airport and he is just a very pleasant and interesting gangsta so running into him again here at SXSW was cool. S/O's to 5ive. I hope today at SX we can amplify this feeling... Imma need my kimchi on a taco while i'm sitting on a giraffe made of diamonds. Clearly anything can happen in Austin. Weird!!!! I had the BEST tofu. It was marinated and fried and just yes. Pure yes. Walked 5.7 miles around the same 6 blocks. I don't know what St. Patrick's Day is like on Water Street in Milwaukee, but St. Patty's down here? SO MANY PEOPLE. We got tricked. Syn wanted to go to 5th Street first and ease into 6th. 5th was cool. Walked in to this Russian theme bar with a wall of "Bertie Botts Every Flavor Vodka (from Peach and Mango to Mixed Nuts and Horseradish)" and saw this dope group call OSHUN. They're like a Neo-soul/Rapping/singing/Black Excellence duo. I'm sure somebody will link their Instagram right here. Literally got called into the bar from the sound of Trumpets and Electric Rhodes. THEN WE MADE THE MISTAKE OF GOING TO DIRTY SIX. So many people. So much skin. So many smells. So many things on the ground. We literally moved to higher ground for safety in a bar on the corner. We didn't make it off the corner! Starting to feel a little claustrophobic down here. I need to see more of the city. Maybe a rest day. Austin is wild, B. Day Two was interesting to the say the least.